Thanks to their skills, their arming and the ability to wear heavy armor the Warrior plays a central role in close combat. They only strive for great physical strength and balanced mind. According to their specialization, they can cause devastating damage with Two-Handed weaponry or they can parry the attacks of their enemy with both sword and shield. There are two classes of warriors. One class (mental warriors) is a tank, with an almost unbreakable defence. The body warrior, however, is for a more offencive style of play. Warriors mainly use the stats VIT and STR, until both are on 90 and afterwards DEX. 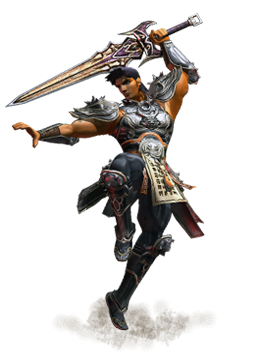 For a Body Warrior it is very important to have STR as it increases attacks directly, as well as indirectly influencing Aura Of Sword. When a Mental Warrior has VIT it reinforces their defence directly, as well as indirectly affecting their Strong Body. Whether or not you want to have lots of defence or attack with huge amounts of damage is purely down to taste. The stats of STR and VIT should be around 1:1 but can be altered for personal preference. Mental Warriors are normally best off with Two-Handed weaponry whilst a Body Warrior would be more suited to Swords off Horse and Two-Handed weaponry on a horse. Warriors are normally front line characters and so must be able to endure a lot. Aura of the Sword Increases Attack Power for a period of time. Berserk Only concentrate on attacking. Dash You attack as fast as a Bullet! Sword Spin Spin the sword to attack several enemies. Three-Way Cut Cut the enemy with lightning speed. Life Force You gather every last drop of inner strength and channel the explosive power into a single blow. Spirit Strike (W) Attack enemies directly. Strong Body Increases defence and you won't fall on the ground. Stump Knock over several enemies. Sword Strike Attack enemies directly. Sword Orb You hit the ground with your sword, causing an aura to spread which damages enemies standing nearby. This page was last modified on 8 January 2017, at 19:39. This page has been accessed 167,275 times.